St. Edith’s Well (TQ 552 586) lies below the Pilgrim’s Way in Kent and is the county’s most notable and best preserved sites. It is one of only two wells in the county which are dressed and the only one with a long lasting, over 50 years, tradition. this being St Edith’s procession held on the Sunday nearest to St. Edith’s Day. Chiefly, it was noted for its cure of eye complaints, and Watt (1923) also notes that it cured women’s barrenness. Belief in its curative power continued until the early 1900s. Its fabric is presumably ‘mediaeval’, and according to most authorities was once enclosed within a religious establishment, who were probably responsible for its upkeep. However there s neither archaeological nor written evidence of one but there is a recording in 1419 of a chapel of St. Edith the Virgin, which presumably was near the well and perhaps held a relic. Sadly, we do not really know. St. Edith (961-84 AD) was the daughter of the early Saxon king, Edgar and Queen Wulfthryth. Despite being nominated Abbess of Winchester, Barking and Amesbury, she refused these positions, disliking state affairs, preferring to commune with the poor and animals. This made her popular among her countrymen, who immediately recognised her saintly attributes. Despite this, her canonisation was not recognised everywhere, and Cnut’s scepticism, prevented her feast day being adopted in many areas. 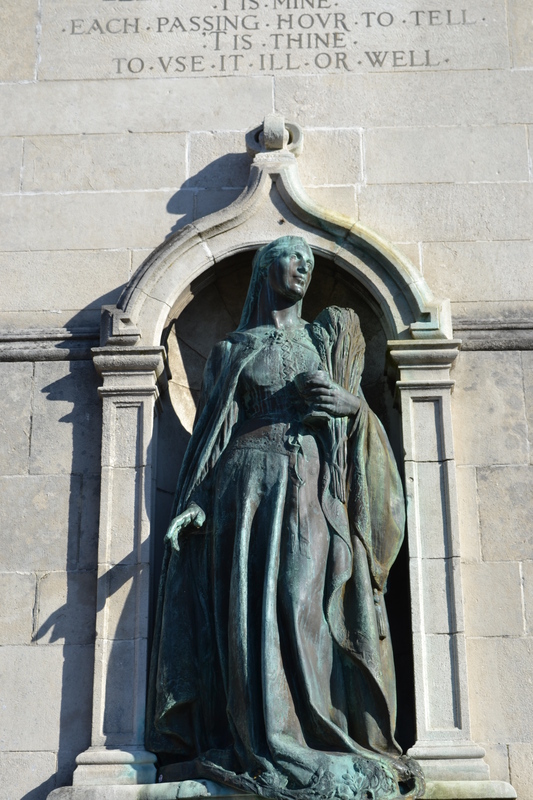 Those who championed her, used miracles at her tomb and her incorruptible thumb, as evidence for her saintliness and she was canonised, with her body being transferred to Wilton in 997 AD. She was said to have been born on land which is now covered by a property called the Box, but again it here is no evidence. This appears to be some persistence of an ancient fertility rite to a pagan deity, further supported by with the cure of cure barren women. Lambarde (1571) believed this, suggesting the Roman god, Robigus (after Robigo, a canker of corn), was the earlier cult focus here. It is recorded that similar ‘sacrifices’ were made to ‘him’, and so it seems likely that even the saint’s effigy could have directly replaced his and the church being built on his temple. The holy water, used in the ritual, may have originated from the well, and in pre-Christian days this may have been an important part of the ritual. Today it lies within a small garden of remembrance forming a focal point for the original village. It is approximately three feet high, a round rag stone structure, with a series of steps approach the well. Access now, via these steps, appears impossible, the gate being locked. Watt (1917) notes that the structure was forlorn, and then repaired, and then forlorn again, but now appears in remarkable condition, being within recent years cleared of much of its overgrown ivy! 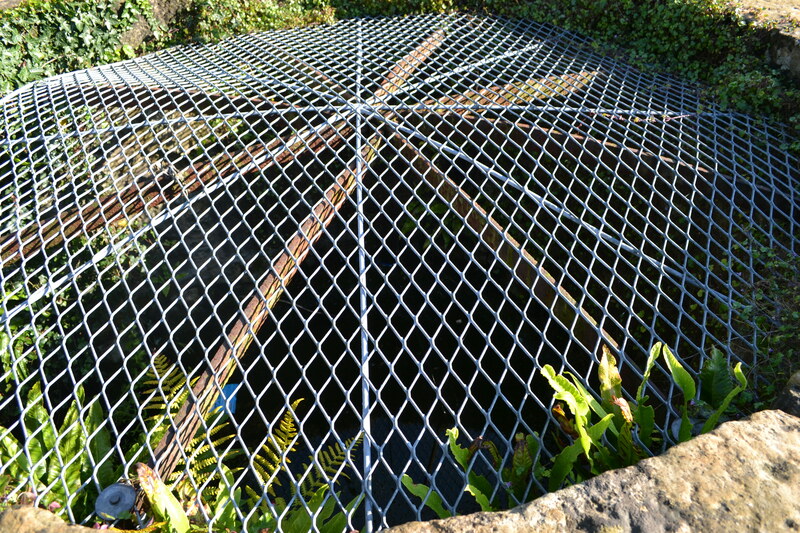 To prevent rubbish falling into the well, brown wiring has been set across, both the well passage, and shaft. A considerable depth of water was present in 2013, and even after a long drought, in 1995. Indeed, I have been informed that it has never been known to dry up! A local belief conveniently ignoring that it was recorded dry at the beginning of this century! Today the well is the best it has ever been although sadly one cannot access the water directly due to the wiring up of the steps. Even today, it is pleasing to note that the well is still an important and respected part of the village. It is depicted as the centre piece of a fine tapestry in the church, and on the village sign. Two separate religious observations are undertaken on the day. In the morning, a procession, established in 1961, after the well was established. It passes through the village from the church is traditionally held on the Sunday nearest the saint’s day September 16th. Every ten years this forms part of a village wide celebration called St. Edith’s Festival, last held in 2011. A banner in the church maybe associated with an earlier 1920s revival perhaps as Mr. Taylor, a local associated with he present Catholic observation suggests. 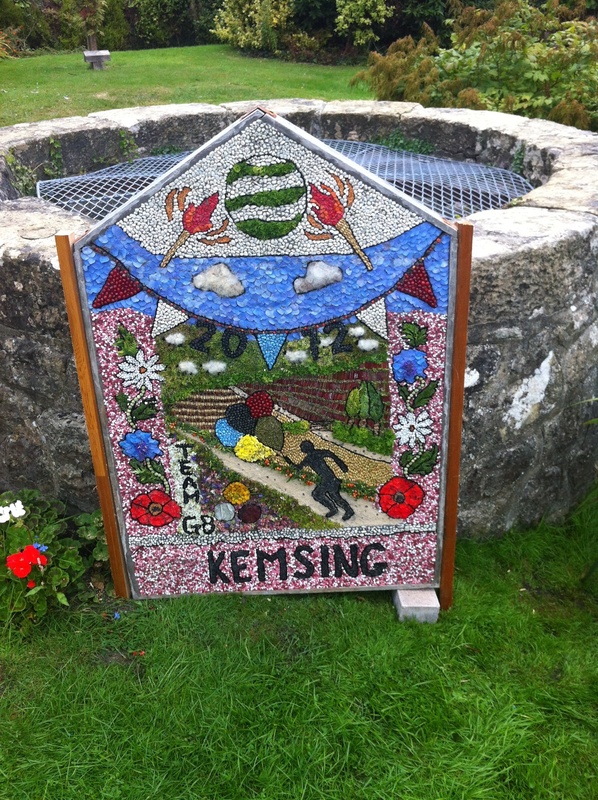 Traditionally posies have been placed on the well during the service by the congregation, but in the last three years, since the 2011 festival, a well dressing has been undertaken place, last year’s was the Olympics, 2011’s was a picture of the village. This year’s was the harvest and delightfully it was rendered too with a good use of rhubarb seeds for a field and gravel for the signage. Next year’s is planned to be the First World War. The artists being two local ladies, one of which would appear to have the tradition running through her veins coming from Elmton in Derbyshire, a village with a well dressing tradition, albeit a modern one. 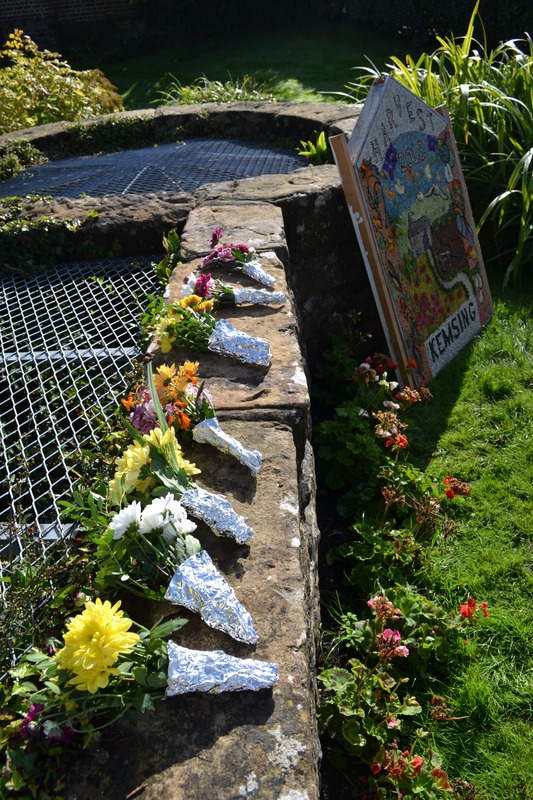 Subsequently, the frame is soaked in a paddling pool each year and taken to the village hall where on a table the two worked away using templates to create their art over the week finally finishing on the Saturday before. 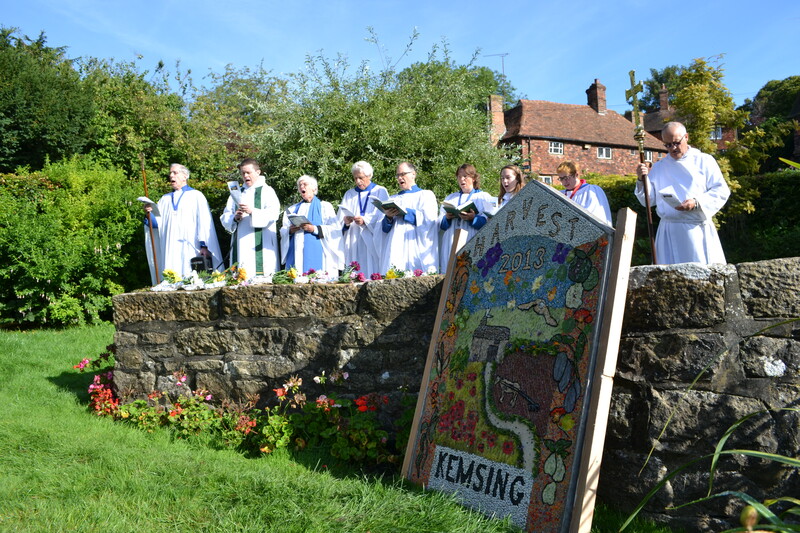 A thanks giving was given for the water and then the well dressing was revealed to the delight of the congregation. 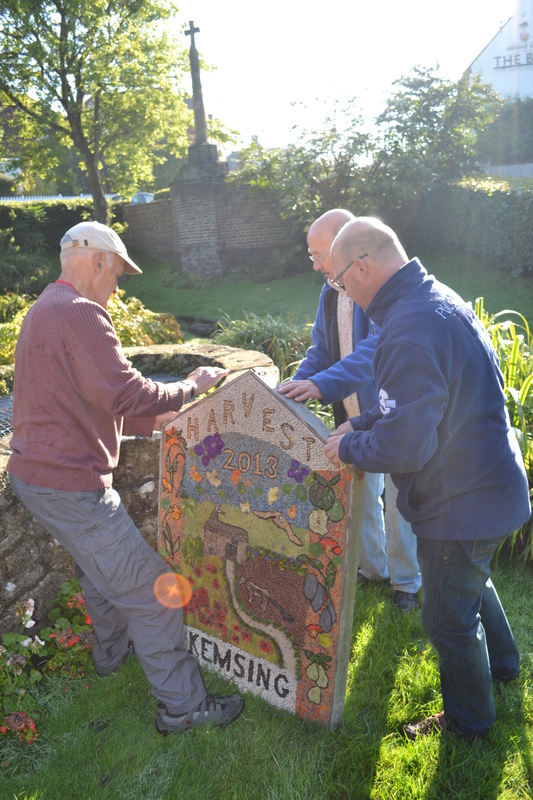 It was great to see that the well continues to be celebrated and the well dressing is a more than welcome innovation. The ceremony ends with prayers of intercession and a collect for St. Edith’s Day, Lord’s Prayer, hymn and blessing. It was a bit disappointing I felt that the support from the village was quite small, especially as everyone here seemed so inviting, but as the service was at 9.45, perhaps it was too early. I recommend moving the service an hour forward and more visitors may be attracted. Christopher Bells’ Centenary History of the Catholic Church of St Thomas of Canterbury states that Father Phillips, Sevenoaks parish priest from 1916 to 1946, probably revived it around the 1920s. An elderly parishioner told Mr Taylor that the pilgrimage was going in the 1930s, but this was actually on the 16th, not the nearest Sunday as of recent. It is possible that as the village was home of Catholic convert Monsignor Robert Benson, son of Edward White Benson, Archbishop of Canterbury in the 1890s the observation may be older. I was told that now parishioners come from all part of the parish which covers the villages of Kemsing, Otford, Weald, Borough Green and West Kingsdown as well as Sevenoaks, some walking 8 miles as well journeying by car from London. It is said that not only does her water cure eyes, but spiritual blindness, and Richard Bateman, the local Anglican vicar, attributed his conversion to Catholicism in part through her intercession. Certainly the Catholic community may be aware of the need to start later. In the afternoon, a Catholic pilgrimage occurs from the nearest Catholic Church based in Sevenoaks. However, in 2013 although they planned to meet at 3.00, the weather had turned to the worse. The glorious weather of the morning being replaced by a penetrating drizzle, subsequently, the planned Holy Rosary, prayers and St. Edith’s hymn which were to be at the well were moved to nearby Otford Catholic church…hopefully the weather will be more favourable next year and they will return. Images and post copyright Pixyledpublications. 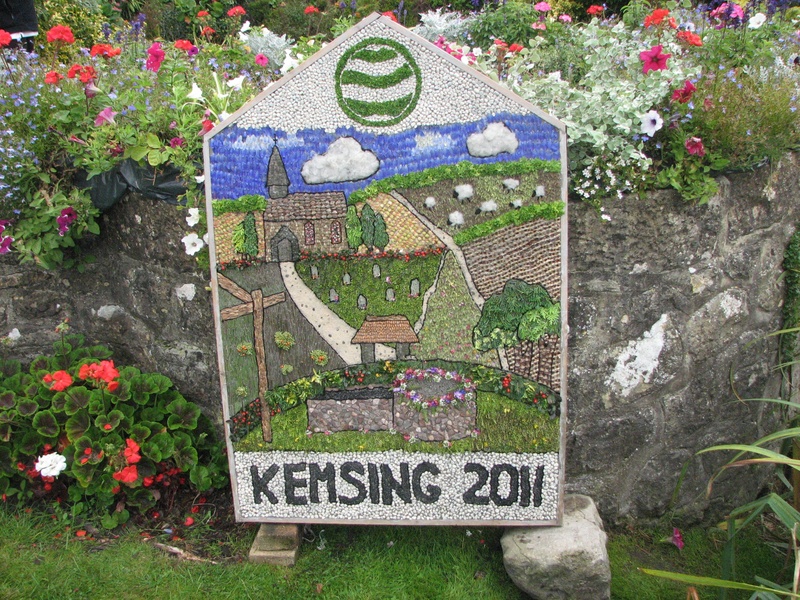 Posted on September 19, 2013, in Kent, Pilgrimage, Royal, Saints, Survival tradition, Well dressing and tagged calendar custom, Catholics, folklore, Holy well blog, Local history, Pilgrimage, procession, Saxon, St Edith's procession, St. Edith's day, St. Edith's day procession kemsing kent. Bookmark the permalink. Leave a comment.